Dopbox for Gmail is an excellent tool to use to ‘send and preview Dropbox files and links without leaving your Gmail window’. We have tried it in multiple occasions and it worked perfectly well. 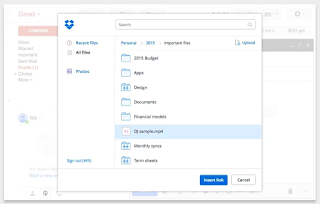 If you are a big fan of dropbox this extension is a must have. Once imstalled, a Dropbox button will be added to your Gmail Compose window enabling you to instantly send large files.